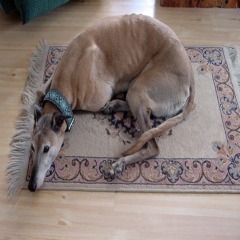 “We are getting a greyhound!” My husband Bill said, after returning from doing some errands a several years ago. This coming from a man who never had so much as a goldfish as a pet. I thought he was talking about a bus. Then he told me about seeing an adoption group for retired greyhounds over at WalMart and that he fell in love. They were so gentle and soft, one of them stood next to another and had his head over the other one’s shoulders just looking so loving and kind, well he just knew that we should have one. We filled out all the paperwork, went to PetSmart and talked again with the adoption people. One of them was our neighbor’s Grandma, and she was the person who would foster our new pet. Our dog arrived in February of 1997, he was a big red fawn and his birthday was in March. So being a creative beer lover, Bill named him Killian Red and we decided his birthday would be St Patrick’s Day. He was already neutered and cat friendly so only spent a short time with the foster family when they called us to come and get him. He was the most beautiful boy I have ever seen. Soft golden coat, big brown eyes outlined like an Egyptian prince. It was love at first sight. Killian was so gentle and beautiful that everyone who looked into those liquid brown eyes fell in love. But he was afraid of men. He cowered when a man wearing jeans and work boots approached him. Bill spent many hours laying on the floor next to him assuring him that no one would every hurt him again.Finally he did warm up to men and became the “spokes dog” for the cause. We went for walks, meet-and-greets, car shows, flea markets and everywhere we went Killian turned heads. Many people who met him decided to adopt. We decided to become chippers. What’s a chipper?